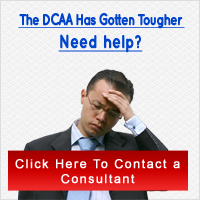 If you are planning to become a government contractor, you should also plan for a DCAA Accounting System Review. The Accounting System Review is done for several reasons, one of them being to ensure that your accounting system is standardized and adequate to properly document all actions during the life of your contract. Your system, depending on type of contract, must be able to do address the needs according to the contract type. The types and review goals of contracts are ensuring that systems for fixed-price contracts can determine progress payments; that systems for â€œcostsâ€ contracts can accumulate costs, and that systems on recently approved contracts can estimate future costs. Unfortunately, the above items are not the only things an auditor will be looking for. They also want to see that you have proper policy and procedure manuals that align with company practices and consistency. Additionally, the auditor is ensuring that you have proper segregation and allocation of costs and line items, along with internal controls. Human resource issues will be evaluated for compliance of timesheets, timecards, proper authoritative signatures, and work distribution. Moreover, and perhaps the most important aspect of the DCAA Accounting System Review, is the checks for tracking all types of costs. This would include, direct and indirect costs, allowable and unallowable costs, interim costs, budget and reconciliation controls reports. Now the above is a good start when preparing for an audit and DCAA Accounting System Review. Yes, it may make you cringe, but it will be fine. Take the time to read up on the DCAA Accounting System Review policy and procedure and learn what will be expected of you and what will be taking place during the review. If this is your first DCAA Accounting System Review, donâ€™t hold your breath and read over everything that addresses the DCAA Accounting System Review twice to make sure you have everything in place and ready. If you have already gone through the DCAA Accounting System Review read over everything that addresses the DCAA Accounting System Review three times to avoid getting too comfortable with contract expectation which can easily lead to a DCAA Accounting System Review foul-up.